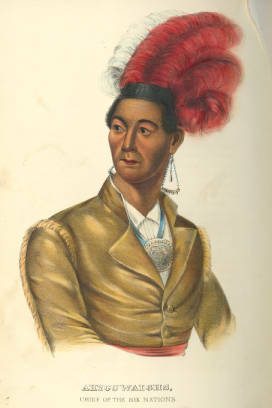 Ahyouwaighs, Chief of the Six Nations. The Six Nations was a confederacy of Iroquois nations that included the Mohawk, Oneida, Onondaga, Cayuga, and Seneca. Starting in 1640, the Iroquois Confederacy, a confederation of five Iroquoian-speaking American Indian tribes, began a campaign referred to as the Beaver Wars during which they fought other American Indian groups, including those in the Ohio Country, for their lands and territories in order to gain access to their fur-bearing game animals, especially the beaver and deer. The Iroquois originally became involved in the fur trade with Anglo-American settlers in the early 16th century, primarily with Dutch and British merchants, where they traded animal pelts in exchange for firearms, iron tools, blankets, and other objects. Over the course of the more than 200 years of involvement in the fur trade, the Iroquois Confederacy eventually became dependent upon the items they received in exchange for furs. The metal tools and guns were more efficient than the stone tools and arrows they produced, and as time passed, the Iroquois began to prefer these items and depend on them for survival. In turn, Anglo-American settlers began to control the fur trade because they supplied the goods the American Indians so highly valued and relied upon. However, the competitive nature of the fur trade led to much hostility and bloodshed between American Indian tribes. By the mid-17th century, the Iroquois depleted beaver populations in their homeland in the St. Lawrence River region and looked to the abundant resources of Algonquian-speaking tribes such as the Lenape or Delaware, supported by the French, in the Ohio Country. Dependence on the fur trade pitted American Indian groups against each other in their struggle to maintain and acquire new hunting and trapping grounds and compete for relationships with colonies. As a result, the relationships between Native tribes and colonies strengthened, while inter-tribal and inter-colonial relationships suffered. Between 1650 and 1700, the Iroquois Confederacy drove out the Huron, Petun, Erie, and Sisquehannock Tribes who were allied with French fur traders and who had well-established communities and territories in the Ohio Country. The Iroquois Confederacy pushed these Tribes west, and destroyed alliances of the Erie, Huron, and Shawnee. The Iroquois Confederacy gained control of the Ohio Country by 1656. The Iroquois did not fight without great losses of their own. In retaliation, the French invaded Iroquois villages and surrounding lands, destroying their crops and homes, resulting in many Iroquois starving to death the following winter. The Beaver Wars ended with the Treaty of Grande Paix, or Great Peace, in 1701, between the Iroquois Confederacy, the British, and the French, in which the Iroquois agreed to stop their campaign against tribes in the Ohio Country and allow those pushed out to return to their lands. Although the treaty was a written attempt to put an end to this bloody campaign, conflict continued between the British, French, Dutch, and the American Indian tribes over land control for many decades after, especially with the French and Indian Wars on the horizon as European powers fight for control over North America and American Indian tribes fight to maintain control of their lands and territories. The best historic records of the Beaver Wars come from The Jesuit Relations, a series of letters and accounts written by Jesuit priests who came to North America to convert native peoples to Catholicism. These records include some of the first written references to the American Indians who lived in Ohio before the Beaver Wars.